Just know that the tag has been attached to this cap for over 22 years. That tag could buy you a beer, provided of course that you are of legal drinking age. Also, the tag would need money to purchase the beer and everyone knows tags don't have money. Variations of this logo have been around since the early days of the Memphis Chicks, but this particular version was only used in 1992. The squarish green underbrim is typical of New Era minor league caps from this period. I am not certain what fabric makes up the inside of the front panel but it seems like this will be a nice breathable cap for the summer months! I've spent the past few weeks celebrating some different New York Yankees fitted caps so I thought it would be a fun change to take a look at a minor league snapback this time around. 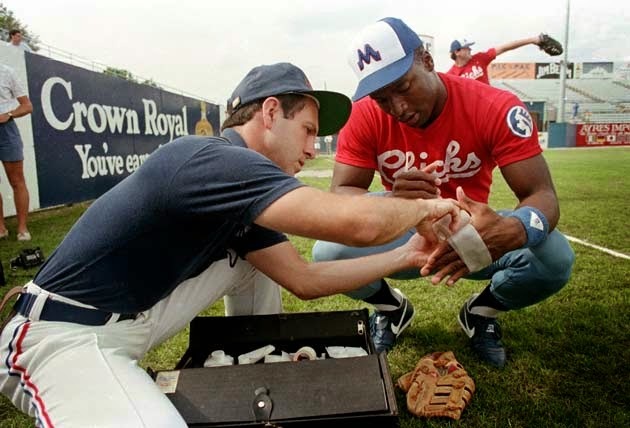 As far as minor league hats are concerned, the 1986 Memphis Chicks on-field cap is holy grail for me. This is mostly because Bo Jackson made his debut for the Kansas City Royals that year. This is a great photo from The Sporting News that shows a young Bo rocking that cap. I really dig that "M" but I can appreciate it even more knowing that another baseball hero of mine, Tim Raines, wore a cap with a nearly identical logo when he played for the Memphis Chicks in 1979. 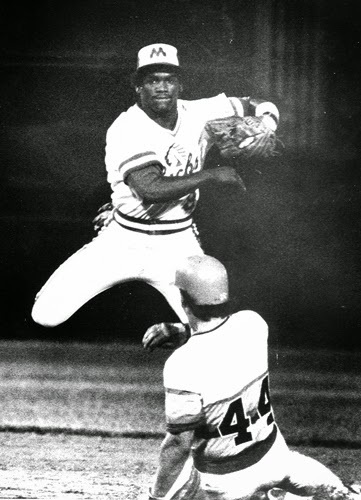 Thanks to Memphis Flyer, here is a nice action shot of Raines displaying some serious athleticism at his former position of Second Base. It turns out that the cap I've been in search of is incredibly difficult to track down so when this 1992 Memphis Chicks cap turned up, I wasn't able to resist it at all. Even though it isn't quite the one that Bo wore, it has a striking design. Besides, the Chicks only wore this cap for one season so maybe it's even more rare than the 1986 cap after all!